The creative Harmony House Soup Mixes are the starting point for our popular and timeless Gourmet Soup Blends, and now they are available to you! 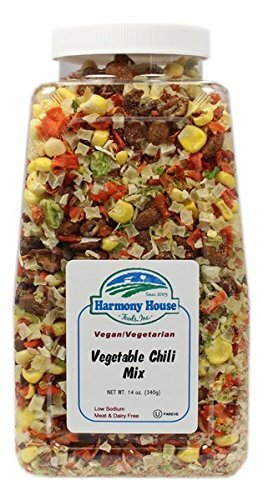 The Vegetable Chili Mix is the base for our Verylicious Veggie Chili Blend, but without the added salt and seasonings! This mix starts with premium pinto beans, and then adds creamy white potatoes, bright carrots, Non-GMO corn, fresh tasting cabbage, vine ripened tomatoes, and sweet onions! This blend not only deserves the attention of all chili lovers, but it also contains 68% of the RDA for Vitamin A in every serving. Make sure to always have a Jar in the Pantry for when company comes over. BACKPACKING NOTE: Our Soup & Chili Mixes are an essential part of trail cooking. You can pre-measure and season the mix, and put proportion size servings in empty Zip Pouches prior to your excursion. Mix can be soaked prior to cooking to reduce the need for fuel. This can be done at mealtime or early in the day to save time during meal preparation. Just open the zip pouch, pour about 1/2 cup water in the pouch, and reseal. When you reach your campsite, simply pour the contents of the pouch into your pot, add the remaining water, and heat to serve. Low Sodium and Low Fat. Season this tasty blend just the way you like it! Gently air dried and carefully selected Non-GMO vegetables. Makes 24-30 servings. Saves time AND money! Store for 1-2 years in your pantry. No more wasted food.